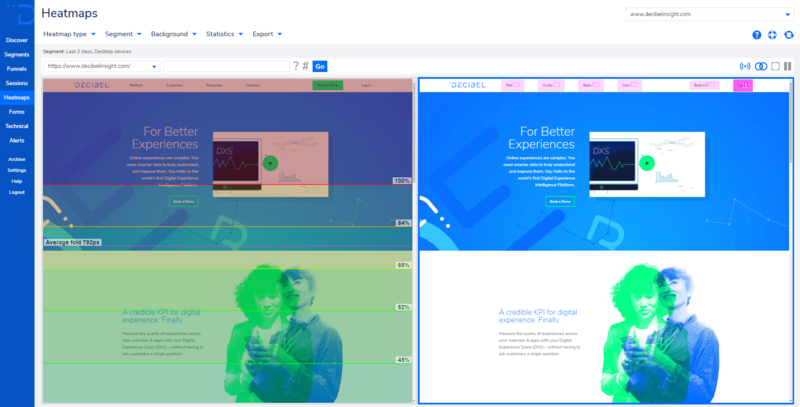 Using Comparison Mode will result in two Heatmaps loading side-by-side, allowing you to see how user behavior changes based on the parameters you set. Comparison Mode can be enabled at any time by simply clicking the Comparison Mode icon (image below, squared) in the top right hand corner, next to Boundary Mode. This will now load two Heatmaps, side by side. Scrolling down the page on one of the Heatmaps will also scroll the other Heatmap. Comparison Mode allows you to compare any type of Heatmap for the same page and device type. You can change the type, period and filters for each Heatmap. Simply click on a particular Heatmap, which will then be highlighted by a blue rectangle, and then update the Heatmap Type, the date range, or apply any filters to this. When using the Attribution or Hybrid Heatmaps in Comparison Mode for Attributed Clicks and Hovers, you can see all of the Session Replays of users who click or hover on a particular element of the page by hovering over the number by the element that you are interested in and clicking the Show Visitors button, while you can do likewise in Scroll Heatmaps by hovering over the percentage and clicking Show Visitors. This will show you a list of all of the Sessions that clicked on the relevant piece of content, and you can click the Play button next to a relevant session to see the Session Replay for that visitor. Meanwhile, when using the Dot Heatmap in Comparison Mode, for Dot Clicks and Hovers, you can view all of the Session Replays from selected clicks using our Boundary Mode feature. Simply click the Boundary Mode square icon which can be found in the top right hand corner (image below, squared). You will now be able to click and drag your mouse over a selected area of clicks. This will create a red square over the selected area and will calculate the total number of clicks over hover time, which can be seen by hovering your mouse over the filled red square in the top right hand corner of the selected area. Clicking Show Visitors will provide you with a list of the Sessions that clicked or hovered in the selected area, and you can click the Play button next to a relevant session to see the Session Replay for that visitor. You can also select to ignore these clicks and hovers using the respective Ignore button which will re-draw the Heatmap excluding these clicks and hovers. You can export the currently selected Comparison Heatmap as a PNG, CSV or JSON files using the Export feature, while you can also export sessions data when using Boundary Mode. Copyright © Decibel 2018. All rights reserved. US technology patents pending.